Hanover, April 10, 2013 – ABB, the leading power and automation technology group, today launched the Terra 53, the first 50-kilowatts (kW) CCS DC fast charging station verifiable compliant with BMW i3, Volkswagen e-up! and e-Golf, as well as other CCS cars expected in the market from autumn 2013 onwards. The Terra 53 C is the first product configuration from a family of DC charging stations supporting the CCS standard. The Terra 53 C will be available for deliveries from summer 2013 throughout Europe. From autumn 2013 there will also be dual outlet configurations available, in the same compact formfactor, for the German market supporting both: CCS and type 2 mode 3 fast AC charging. Last but not least, a triple outlet version will follow when CHAdeMO is added. 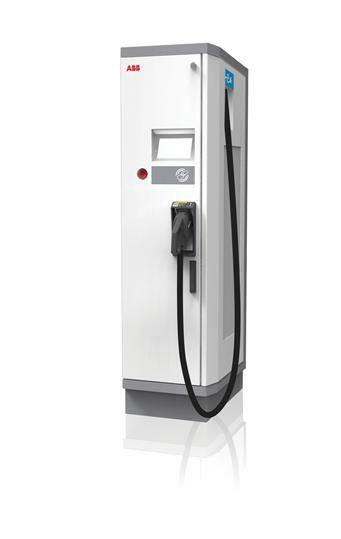 With its convenient 15 to 30 minutes charging time, the Terra 53 C is an obvious choice for highway & urban ring, professional fleet, (larger) CCS importers/dealerships and other infrastructure owners interested in tapping into the growing EV charging revenue stream and complements ABB’s existing portfolio of fast charging solutions for the commercial, and office segments. The launch of the Terra 53 C demonstrates ABB’s leadership in supporting the new charging standards. The Terra 53 combines profitability with functional design and state-of-the-art technology. The cloud connected Terra 53 is compatible with any charging network or payment & billing platform through open standards based interfaces, such as the widely adopted Open Charge Point Protocol (OCPP), enabling easy and secure payments via smart-phone, parking management terminals, RFID or pin code access. Terra 53’s smart connectivity allows remote monitoring, pro-active maintenance and functional upgrades providing customers with the tools necessary to gather customer specific usage statistics and reports. ABB was the first company to demonstrate a working prototype of the CCS standard at EV26 in Los Angeles and at eCarTec in Munich in 2012. ABB continues to be the market leader throughout Europe for its expertise in deploying and managing nationwide EV charging networks, the industry leading uptime and reliability and for the company’s long-standing leadership and 'commitment to excellence' within the EV charging industry. To date, the company has helped facilitate the creation of nationwide charging infrastructure networks throughout Northern-Ireland, Denmark and Estonia.